Mugly is a boss appearing in the game Donkey Kong Country Returns and Donkey Kong Country Returns 3D. He is the first boss that Donkey Kong and Diddy Kong face. Mugly is faced in the Jungle area and his mission is titled Mugly's Mound, where he is hypnotized by Kalimba. He is a relative of Thugly, the boss faced at the end of the Cliff area. At first, Mugly is a yellow dinosaur-like monster. He walks on all fours and has a huge mouth with many white, crooked teeth. Mugly has two lazy eyes as well. The monster is covered with red spikes that he can retract at will. During Mugly's second stage, he becomes orange instead of yellow. In his third and final stage, he turns from orange to red. Mugly only has four attacks. His most basic attack consists of running across the screen back and forth. During this time, his spikes are retracted, which makes him vulnerable to a jump attack. Mugly can also bounce along the stage, trying to crush Donkey and Diddy beneath him. His spikes are also retracted during the entirety of this attack. During Mugly's second and third stage, he can jump high in the air and create a huge shockwave when he lands. Also, during Mugly's second and third stage, he can charge fast at the duo, but this can be easily jumped over. This causes Mugly to run into a wall and succumb to dizziness. The Kongs then have a chance to jump on him while he is unconscious. During each stage, he attacks more often and performs them faster. In Time Attack mode, Mugly has to be defeated in one minute and fifty-seven seconds for bronze, one minute and twenty-three seconds for silver, and fifty-six seconds for gold. For a shiny gold medal, Mugly has to be beaten within thirty-eight seconds. Mugly doesn't even peel bananas before eating them! Maybe he gets his yellow skin that way. I'm sure he's a lovable monster when he isn't controlled by evil Tikis. When he charges, his spikes go away—maybe so he can go faster? It definitely exposes his weak spot... You know how eating carrots all the time can turn you orange? If bananas have a similar effect, that might explain Mugly. His spikes retract whenever he charges, which is either a sign of his better nature when he's not hypnotised by the Tiki Tak Tribe, or just a regular old weak point! 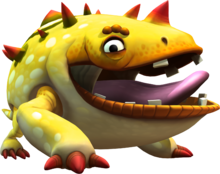 Mugly, with his spikes retracted. Mugly's color changes to orange. Mugly, when he's colored red. Donkey Kong evades Mugly's charge attack. Mugly is stunned after using his charge attack. Mugly slams the ground to make shockwaves. Spanish Mufeo Possible contraction of muy feo, meaning very ugly. In 2 player co-op mode, if Diddy Kong fires enough peanuts at Mugly or Thugly, they will retract their armor and eat the peanuts. Two statues of Mugly can be seen in the background of Jungle Hijinxs, which release bananas that are required to obtain a Puzzle Piece. The same statues can be seen in Donkey Kong Country: Tropical Freeze, in the background of the Homecoming Hijinxs level. Mugly also makes a cameo, frozen solid, in the diorama of Donkey Kong Island in the latter game. This page was last edited on March 28, 2019, at 12:31.